The Mobile SAP 505 Sailing Site provides a mobile presentation of information surrounding the 505 World Sailing Races sponsored by SAP. The event is schedule to be live from April 22, 2013 to April 27, 2013.The primary focus of the site will be to provide a rich set of information and comprehensive experience for visitors that will be at the event site and interested parties around the world. 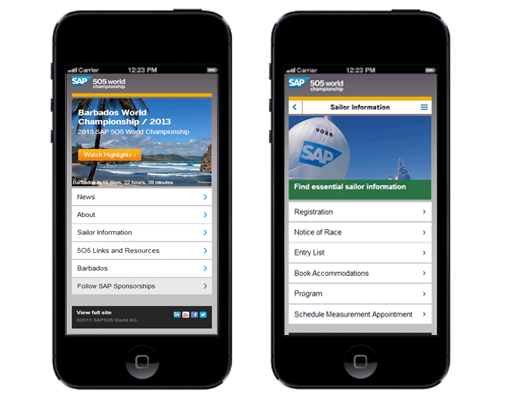 The Mobile SAP 505 Sailing Site incorporates a number of technologies to present a rich and interesting online mobile experience. The site is built on CQ5. It will take advantage, as much as possible, of existing templates built for SAP Mobile and the Sapphire Now Smartphone Experience. Workflow for content creation, management, and editing is a variation of the process used for the Sapphire Now Smartphone.